Uncategorised That's more like it! Have just come out of a session where I finally got the $27 buy-in curse off my back, scoring a 1st and a 2nd at literally the same time as I was finishing up in $27 45mans. I needed a session like that just to reinstall my confidence. I've decided to start playing the 45-mans again, because the synchronised breaks that have been slowly filtered in have now been introduced to them. I am so happy about this!!! (see here). 5 minutes with my eyes not staring at a screen, and not having to concentrate for 4 hours non-stop can only have a positive effect on my game as far as I'm concerned. This isn't to say I'm done with the 18 mans as I might still play them to "mix things up". I've had positive results in the 1000 game challenge I set myself, 1/3 of the way through I'm running at an 8.5% ROI, which is close enough to my target of 10%. 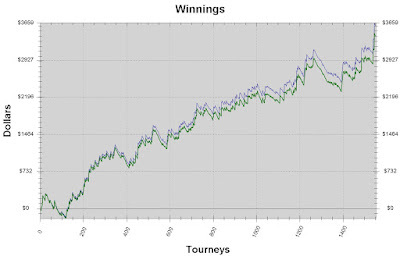 But with a 1550 game sample to my credit in the 45-man tournaments, I have earnt $2 a game in them, which I'm very happy with. I just needed to work my way through that downswing. Upon reflection of my graph, I don't really have much to complain about. 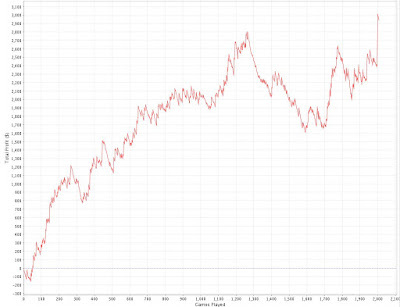 I need to understand that these SNG MTTs are bound to be swingy, and have to deal with the swings appropriately. It's funny how differently you react after a losing or winning session. I realise that it makes sense, but I think you can become irrational one way or the other. Just because you have 1 great session doesn't mean you can start thinking about making mega-bucks, and just because you run bad for a while doesn't mean you should quit completely and move to a different game. Next time I hit a bad stretch, I'll try and console myself by looking at the gradient of my 45-man graph (assuming I can keep it going in that direction). Am planning to put some volume in this week, but the missus is nearly ready to pop so that could be thwarted. I need to earn some money for nappy's before it arrives!!! This not-doing-so-well patch has left me a bit behind schedule. Give me another week or two please!!!!!!!! 3 Comments to "That's more like it!" nice one mate. all these game on Stars yeh? Yeah man. Am "enjoying" Stars atm. Kinda plan to move back over to tilt when I have a roll for the $26s and perhaps when TableNinja comes out for FT.